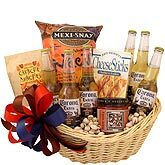 This is the perfect "just because" gift basket, but it's also a great way to make a statement. When the beer is flowing, and the chips are gleefully dipping, there's no better way to say that you care, that you're sorry or that you're proud of a job well done. Whether you want to pat your father on the back from a distance or send well wishes to your best friend down the street, you need no excuse to give someone a little taste of crazy. Make it an unexpected gift, and get ready to unleash the cuckoo for someone who deserves an opportunity to unwind. 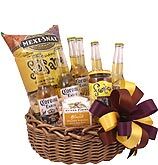 We mailed the "Crazy for Corona Gift Basket" to a great friend for his birthday. The basket got there in plenty of time, he loved the gift, and the whole process was made very easy by Beergifts.com. I sent the corona basket to my son for his birthday and it arrived on time and had everything it was meant to have in it. I was very happy with this service. My father (80 yr B'day) loved it! He told me he was ready for the ball game. Arrived on time. Good job guys!!!! Loved it, thank you so much! Such a great company.